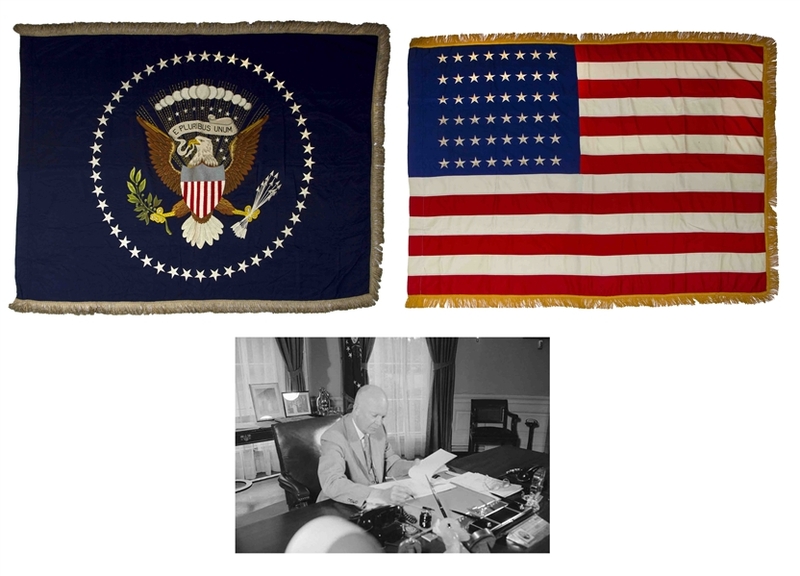 Very scarce set of White House Oval Office flags - comprising both the hand-embroidered 48-star Presidential Coat of Arms flag and the United States flag, which were displayed together in the White House Oval Office of President Dwight D. Eisenhower from 20 January 1957 to 4 July 1959. 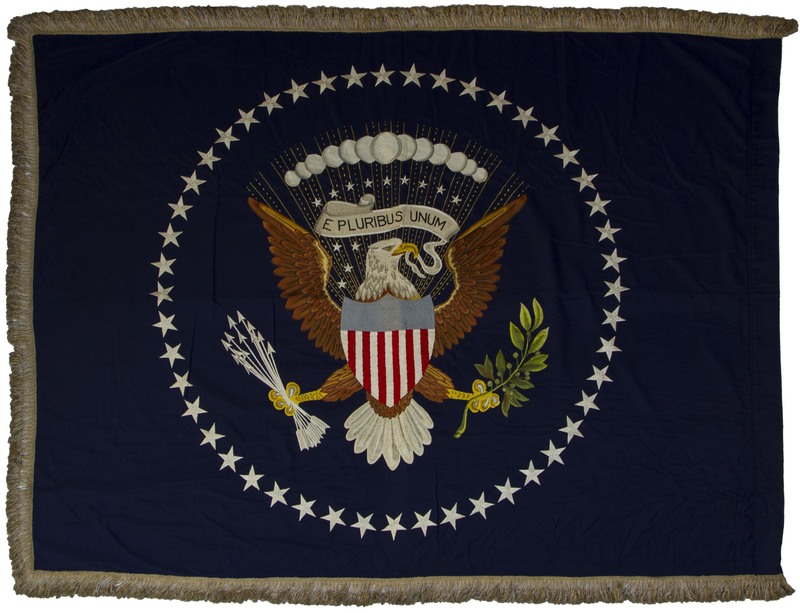 Oval Office flags, which stand on 10' 3" poles behind the President's Resolute desk, are replaced as a set every four years, at which time they become the property of the National Archives and Records Administration, who usually set them aside for display in a future Presidential Library. 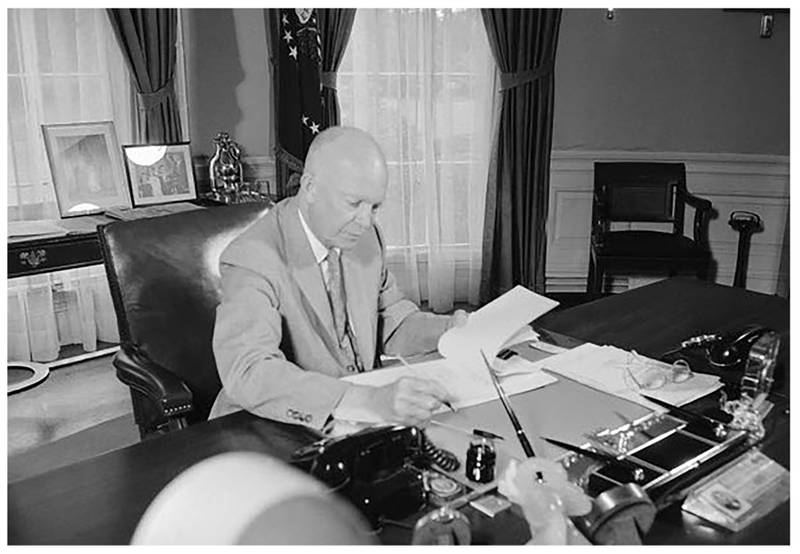 Most Presidents only receive 1-2 sets (2 sets if they are re-elected), with President Eisenhower being in the unique position of having received four different sets: 48-stars from his first term, another 48-stars from the beginning of his second term, along with the 49-stars and 50-stars. 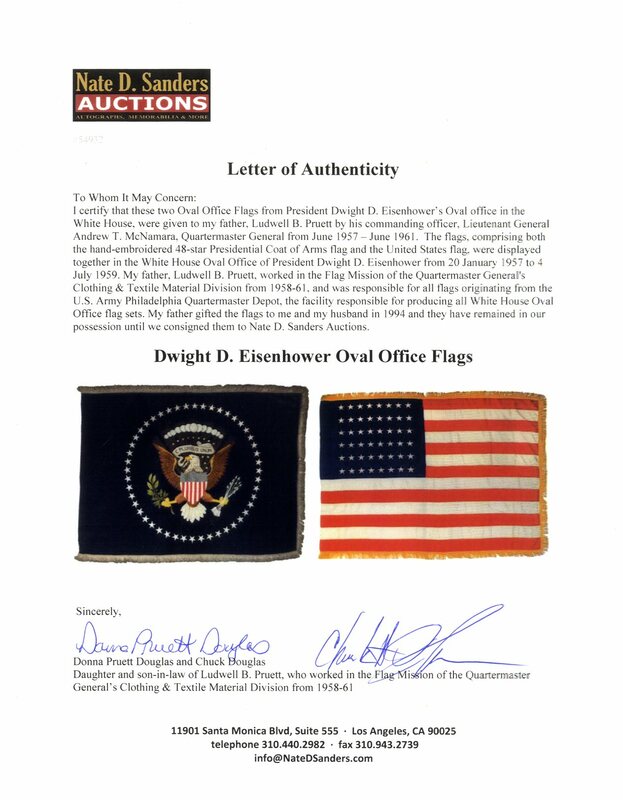 It is for this reason that Presidential Oval Office flags are exceptionally scarce, with the 48-star Presidential flag and the National flag set together even more so. 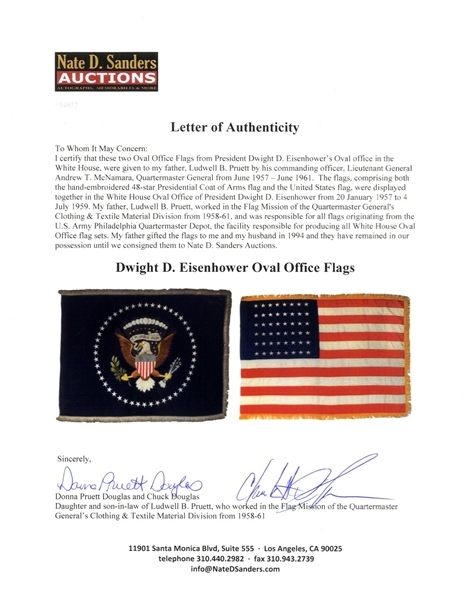 In fact, a Presidential Oval Office flag set for John F. Kennedy sold at auction for $425,000 in 2013. President Eisenhower's other 48-star Presidential Oval Office flag resides in the archives of his Presidential Library in Abilene, Kansas. 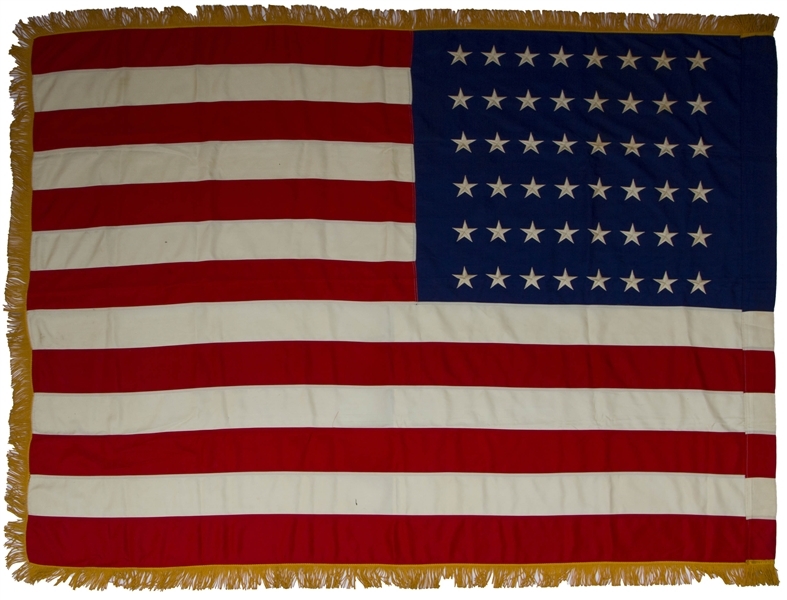 These flags belonged to Ludwell B. Pruett, who worked in the Flag Mission of the Quartermaster General's Clothing & Textile Material Division from 1958-61, and was responsible for all flags originating from the U.S. Army Philadelphia Quartermaster Depot, the facility responsible for producing all White House Oval Office flag sets. 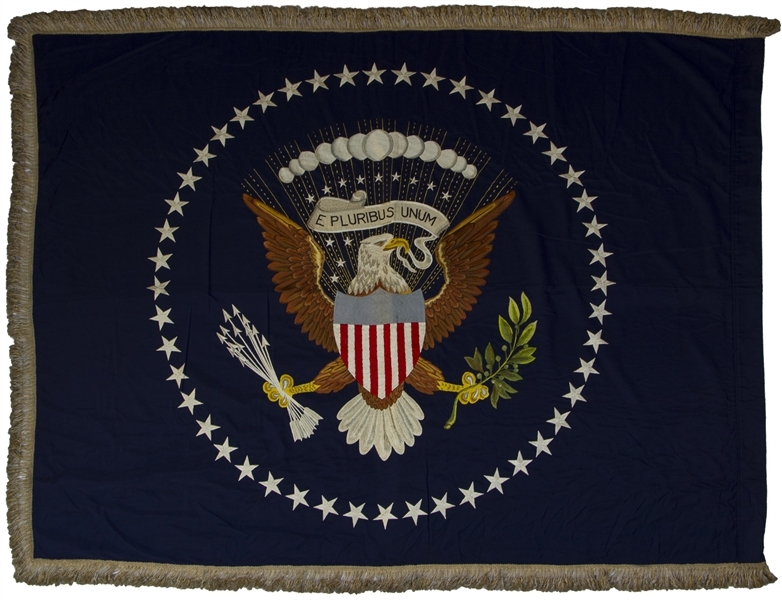 Unlike all other U.S. flags, the Presidential Oval Office flags are uniquely hand-embroidered in the style known as needle-painting and made of silk. These Presidential Oval Office flags are much heavier because of the gold/silver metallic bullion fringe, and hang from two doe skin leather tabs inside their sleeves. Because of their weight, they pull through the leather tabs more quickly and are replaced every Presidential term. 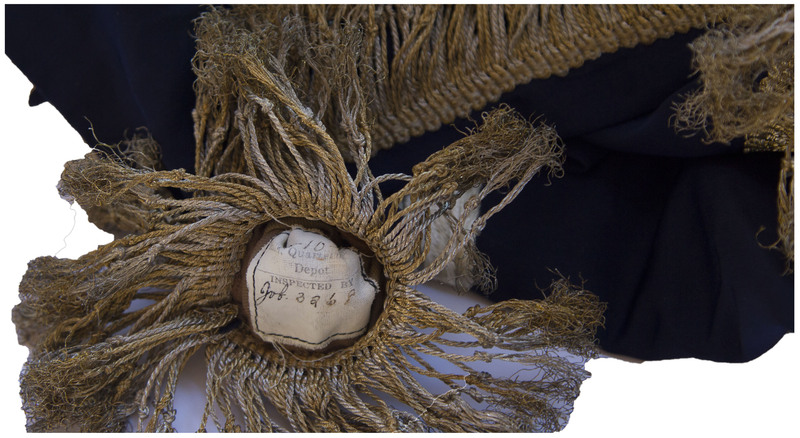 Since President Eisenhower already received the 48-star flags from his first term, the White House staff returned this set to the Flag Mission, who returned them to the Quartermaster for disposition. This set was then given to Pruett by his commanding officer, Lieutenant General Andrew T. McNamara, Quartermaster General from June 1957-June 1961. Pruett would continue to work in the Flag Mission until 1961, when flag procurement was transferred to the Department of Defense. Flags are stunning in their presentation, with vivid colors punctuating the silk material. 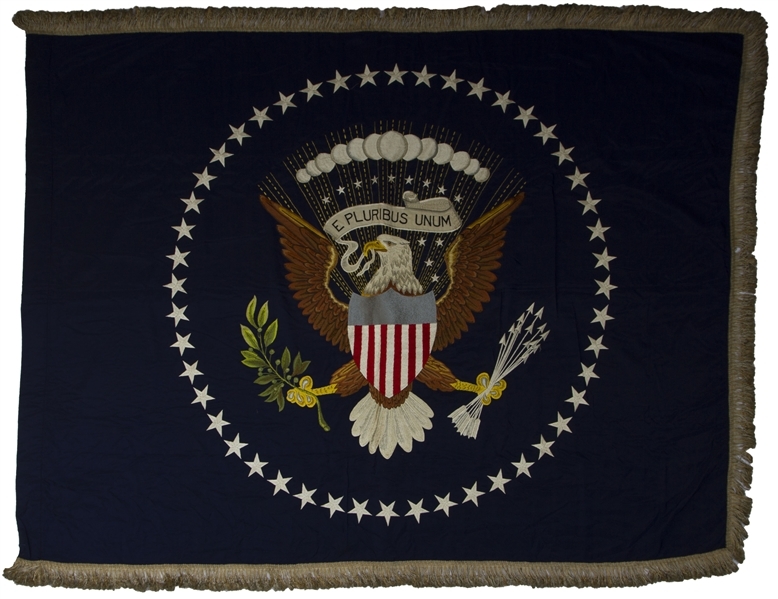 Each flag features 48 stars, with the stars on the Presidential flag encircling the famous Eagle, who holds the banner reading "E Pluribus Unum [Out of many, one]" in its beak. Presidential flag measures 52" x 66", excluding the gold/silver bullion fringe, and United States flag measures 71" x 55" including yellow fringe, each with a "Phila. 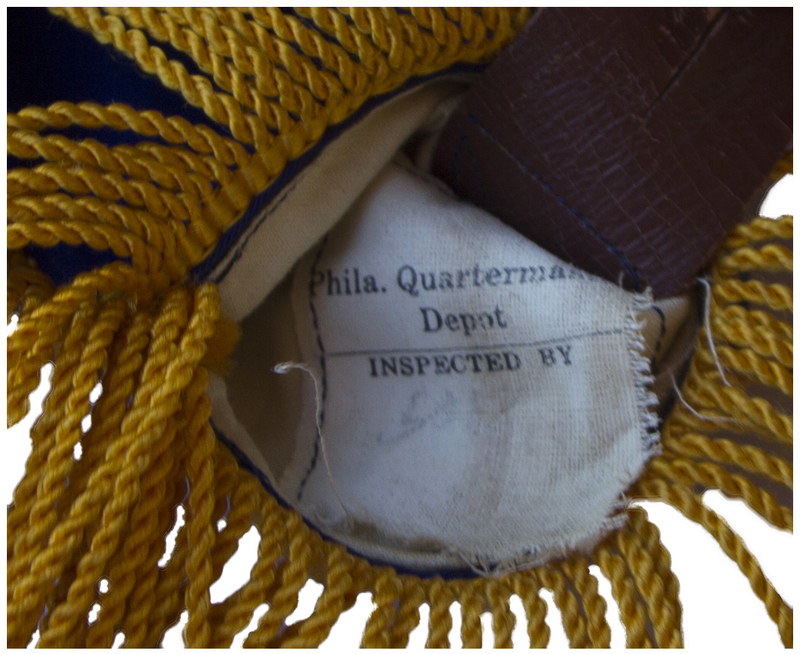 Quartermaster Depot" label sewn within. U.S. flag has some light soiling and one small ink mark, in very good condition. Presidential flag is near fine. 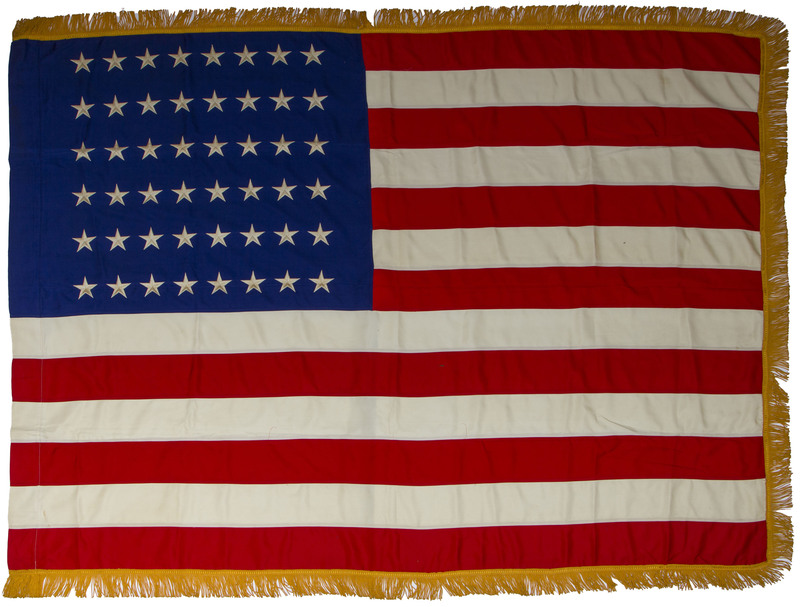 Flags have been kept in storage since their display during President Eisenhower's administration, apart from two exhibitions: at the House of Flags Museum in October 2012 and in October 2013 at the official NAVA Convention [North American Vexillological Association] in Salt Lake City, Utah. A stunning display with exquisite craftsmanship honoring the nation's highest office, the President of the United States of America. With an LOA from the family of Ludwell Pruett, and with copies of documents from Pruett's employment with the Quartermaster General.